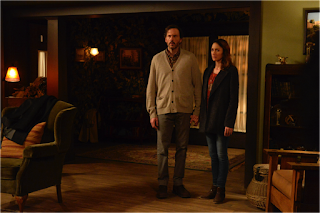 On this week’s Grimm, Eve is looking for a portal to another world and people are being attacked by a roaming Wesen. Let’s get to it, shall we? Eve has gotten it into her head that going over to green-eyed skull dude’s world is a good idea. Why, no one knows. But she is insistent on it, and manages to solicit the help of Adalind to find out how to travel to the world beyond the mirror. Adalind is hesitant. This is dangerous, dark stuff and someone could get killed. But Eve has a feeling this skull dude is coming after her because she can see the symbols, and of course, Adalind’s daughter Diana can also see them. So, that’s good enough motivation for Adalind, who doesn’t want skull guy anywhere near her daughter. Adalind hands all of her mother’s old spell books over to Eve to look through. As soon as Nick gets home, Adalind lets him know what Eve is up to. I’m glad the team isn’t keeping secrets anymore. It makes everything much easier. Nick says he’ll talk to Eve, but before he does that, he has a new case to solve. A girl has just been attacked and killed by a Wesen while she was out to dinner with her friend. There are no leads and neither the dead girl nor her friend appear to be Wesen, though judging from the state of the body, the killer probably is. Shortly after the attack, a kindly orderly named Mason is helping an elderly patient at a nursing home to bed when she starts talking about her olden days of chasing “them” through the woods and the taste of blood. Mason knows the patient, Mrs. Cuttler, has dementia, so he just dismisses what she’s saying. That is, until she woges into a wolf-like Wesen and tries to take a bite out of him. He starts struggling with her when she suddenly un-woges and become confused. A nurse comes in just then and sees Mason with his hands wrapped around Mrs. Cuttler’s throat. Poor Mason. He runs out, clutching his injured arm. Later that night, while the elderly lady sleeps, a creepy green insect Wesen visits her and sticks its tentacles up her nose. The next morning, she’s declared dead and Mason Wilcox is named as the prime suspect. Even though the doctor on duty, Dr. Landau, had declared her injuries superficial, the nurse who walked in on Mason struggling with her thinks he’s at fault. Nick and Hank talk to Dr. Landau, who stands by what he said — that the woman died of old age, not because of Mason’s attack. They’re able to track down Mason, who tries to run from them. Nick and Hank tackle him and haul him in for questioning. He tells them his story of Mrs. Cuttler turning into “some kind of monster” and is shocked they believe him. Nick and Hank visit the morgue to talk to the ME, who confirms that the injuries Mason caused couldn’t have killed her. She did find something strange though, because, of course, Mrs. Cuttler had high levels of a protein only found in bug saliva, specifically assassin bugs. It was in such a high concentration, the ME says, it could have only come from a huge number of assassin bugs. Or, more likely but unknown to her, one giant Wesen assassin bug. Back at the spice shop, Eve is busy consulting Adalind’s mother’s books, which are all pretty creepy. She comes across a section on blood magic and calls Adalind all excited. According to the book, blood can be used as currency to cross into other worlds. This isn’t Adalind’s area of expertise and her warnings to Eve that blood magic is extremely dangerous fall on deaf ears. Eve wants to go through that portal and she’s going to find a way. Adalind reminds her that, even if she can get through to the other side, that doesn’t mean she’d be able to get back, but Eve doesn’t listen. Upstairs, Rosalee and Monroe are waiting on an elderly customer named Mrs. Stanton, who is purchasing a huge amount of melatonin and gets a little cagey when Rosalee tells her to say hi to her husband. Nick and Hank walk in shortly after and tell Monroe and Rosalee about the bug saliva in their victim. It’s Rosalee and Monroe’s turn to get cagey. They urge Nick to let this one go and not pursue this particular bug Wesen, who they describe as “the godfather of death.” Apparently, in the Wesen community, if a Wesen suffers from dementia, the godfather of death is called to help the Wesen pass peacefully. This is due to the fact that a Wesen with dementia is prone to uncontrollable woges that endanger themselves, their family, and the secret world of the Wesen. 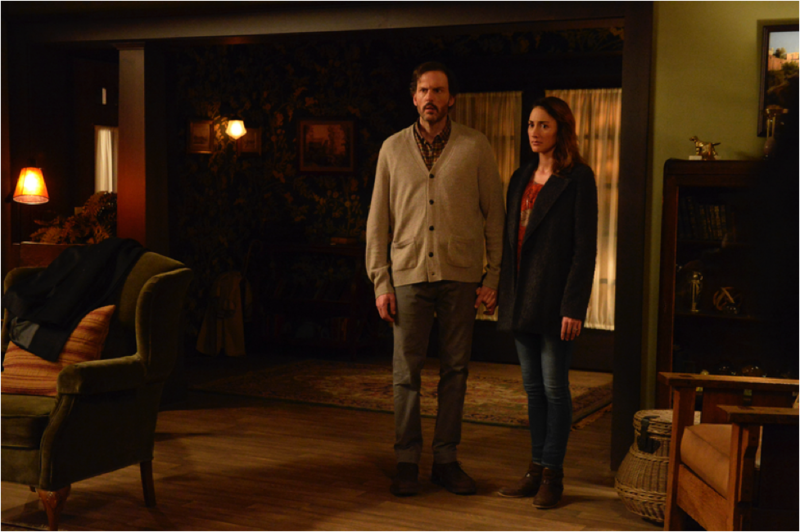 Rosalee and Monroe even confide to Nick that they’ve already made a pact that if one of them develops dementia, they’ll call the godfather of death to aid their passing. Nick asks them to put him in touch with this Wesen and despite their better judgment, they agree. Nick and Hank head back to the precinct, where Wu has something to show them. He’s been reviewing video footage of the vicious murder of the girl in the parking lot and the other victim who was attacked in the same manner. Both were being followed by an elderly man with a cane. Wu doesn’t think it’s a coincidence. Neither do Nick and Hank. Just then, Renard calls Nick into his office and they bicker as usual. Renard has been trying to track down what the symbols Diana’s been drawing mean through is European contacts. He hasn’t gotten far — except to find out they’re dangerous — and he knows Nick knows something. Renard already tried calling Adalind earlier, demanding to see the tunnel where the symbols are, but Adalind told him to take it up with Nick. Taking it up with Nick doesn’t go very well though. Nick says this flow of information Renard wants needs to be a two-way street and if it’s not going to be, then he has nothing to share. Then he storms out to get back to his open cases. Over at Monroe’s house, he and Rosalee have been awaiting a call from the bug Wesen when the phone rings. It’s him. Rosalee panics a bit and tells the guy that it’s Monroe who has dementia. Oops. After they hang up, Rosalee calls Nick and tells him to hurry over. When the bug Wesen shows up, it’s Dr. Landau. After Nick convinces Dr. Landau he means him no harm, he then tries to convince him to help Mason by convincing the nurse at the nursing home that Mason had nothing to do with Mrs. Cuttler’s death. Dr. Landau finally agrees that he’ll do his best so that Mason doesn’t have to go to jail for a crime he didn’t commit. Suddenly, Dr. Landau gets a call. An elderly Wesen has attacked his wife. Nick says he’s coming with Dr. Landau and when he tells them the address, Rosalee realizes it’s her customer, Mrs. Stanton’s address. They all take off for her house. Mrs. Stanton says her husband has never attacked her before but she fears he’s been sneaking out at night and doing bad things. Looks like this is the attacker Nick, Hank, and Wu have been hunting. They manage to track down Mr. Stanton, who was wandering around looking for his wife. They tell him they can bring him back home to her but he woges and struggles with them. They manage to get him back but he doesn’t recognize his wife. Wu brings over the video footage and they look again and see that Mr. Stanton’s cane is a match to the one in the video footage. He’s definitely the Wesen who’s been killing people, though he clearly has no idea what he’s done. Nick tells Dr. Landau to go ahead — he won’t interfere with what he has to do. While Rosalee comforts Mrs. Stanton, Dr. Landau woges and helps Mr. Stanton pass peacefully. Back at Monroe and Rosalee’s house, Eve comes bursting in, telling them she’s found something. They’re not home because they’re at the Stantons’ house, but Eve doesn’t want to wait. She tears the paper off a mirror, cuts her hand, and smears blood on the mirror. At first, nothing happens, but then a portal opens in the mirror. She goes through. This was a truly heartbreaking episode and a surprisingly real look at the painful reality of dementia. The Grimm writers have been pulling no punches in this final season, and this episode was no exception. It was easily the most emotional Grimm episode ever. Beautifully written and acted. Excuse me while I go curl in the fetal position and bawl my eyes out for the rest of the night.